As a long-term project, AutoSpeed and Labtronics are developing a new, low-cost digital air/fuel ratio meter. Part of the product development research has involved intensive testing of the best meters and sensors that are in common use. In addition, examination has been made of a range of literature, including original patent applications, sensor specification sheets, and other hard to find material. In fact, some of the temperature correction techniques covered in this article have never before been seen in general automotive literature - buried as they previously were in obscure patent applications. 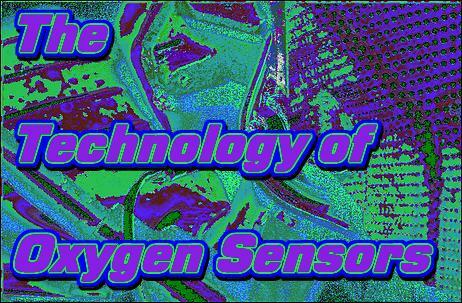 This article backgrounds some of the technical aspects of common oxygen sensors. Exhaust gas oxygen sensors (sometimes called Lambda sensors) are mounted in the exhaust manifold of all cars produced over the last 15 or so years. The sensor is designed to detect the amount of oxygen in the exhaust gases, and by doing so give an indication of the instantaneous air/fuel ratio that is being used by the engine. Most sensors take the form of a zirconia device, which outputs a voltage of approximately 100 - 900mV, depending on the mixture strength. The sensor is designed so that it 'switches' voltage (from high to low or vice versa, depending on the air/fuel ratio trend) around air/fuel ratios of 14.7:1. In most cars, the oxygen sensor is used in a closed loop process to maintain an air/fuel ratio of about 14.7:1 ("stoichiometric") during idle, light load and cruise conditions. In this way, emissions are reduced and the catalytic converter works most effectively. However, the use of programmable engine management (where the air/fuel ratio can be set to whatever is wanted anywhere in the load and rev range of the engine) has meant that there is a requirement to measure the air/fuel ratio well away from stoichiometric values. As a result, commercially available air/fuel ratio meters utilising oxygen sensors are now widely used in automotive workshops. But how can a sensor whose output is very non-linear (with a sensitivity dramatically higher around stoichiometric ratios) be used to reliably measure mixture strengths very different to 14.7:1? That is an extremely interesting question, made more so by the fact that many commercially available air/fuel ratio meters appear to be quite inaccurate, especially at rich air/fuel ratios and high loads. And the performance of an air/fuel ratio meter at rich mixtures (eg 12:1) is exactly where it is most important that readings be accurate! Why? Because if a car is being tuned on a chassis dynamometer at full load, severe engine damage can occur if the actual air/fuel ratio is substantially leaner than the mixture indicated by the air/fuel ratio meter! 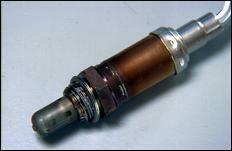 The most common type of oxygen sensor is the zirconium dioxide design shown here (Ford diagram). 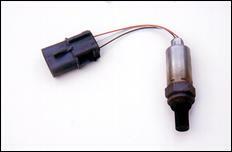 In this sensor, part of the ceramic body is located so that exhaust gases impinge on it. The other part is located so that it has access to the atmosphere. The surface of the ceramic body is provided with electrodes made of a thin, gas-permeable layer of platinum. Above a temperature of approximately 350 degrees C, the ceramic material begins to conduct oxygen ions. If the proportions of oxygen at the two ends of the sensor vary, a voltage proportional to the difference in oxygen concentrations is generated. The residual oxygen component in the exhaust gas is largely dependent on the engine's instantaneous air/fuel ratio - thus the output voltage of the sensor can be correlated with the air/fuel ratio. This diagram (Ford) shows the typical output characteristic of a zirconia oxygen sensor. As can be seen, the output voltage exhibits a rapid switch around air/fuel ratios of 14.7:1. 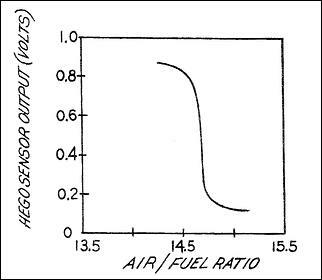 This is the characteristic curve output of a Narrow Band oxygen sensor, as used in most cars. In addition to the air/fuel ratio, the output voltage of the sensor is heavily dependent on its temperature. As indicated earlier, at very low temperatures - below about 350 degrees C - the ceramic material is insufficiently conductive to allow the sensor to function correctly. As a result, the output signal of a 'cold' sensor will be either non-existent or incorrectly low in voltage. To overcome this problem, a resistive heating element is commonly placed within the sensor to quickly bring it up to minimum operating temperature. Once this occurs, the heater can be either switched off, or - more commonly - the heating current reduced. The flow of exhaust gases is then primarily responsible for the heating of the sensor. It is also important to note that as the temperature of the sensor increases, its reading for the same air/fuel ratio decreases. Specifically, one sensor cited in the literature had an output of 860mV at 900 degrees C, which corresponds to an air/fuel ratio of 11:1 air/fuel ratio (which is very rich). At a sensor temperature of 650 degrees C, this same output voltage would indicate an air/fuel ratio of 14:1 (much leaner). 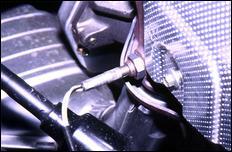 This means that, at high temperatures, oxygen sensors typical read leaner than the actual air/fuel ratio. The temperature of the sensor also has a major affect on its response time. The response time for a voltage change due to a change in mixture can be seconds when the sensor is colder than 350 degrees C, and as short as 50ms when the sensor is at 600 degrees C.
In summary, using the output of an exhaust gas oxygen sensor to accurately determine the instantaneous air/fuel ratio requires substantial linearisation of the output signal. If the sensor is placed so that its temperature rises above about 600 degrees C, further correction of the output voltage will need to be made to compensate for signal output variations caused by high temperature. From the above material it can be seen that the determination of the sensor's temperature can be a vital component in accurately measuring the air/fuel ratio. It would seem logical that a high temperature thermocouple should therefore be placed within the sensor to allow the direct sensing of temperature; however, for reasons best known to the sensor manufacturers, this is not done. Instead, temperature sensing must be carried out using indirect means. When the temperature of the sensor changes, so (dramatically!) does its internal resistance. 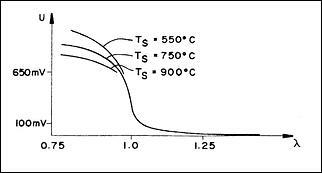 At 200 degrees C, the internal resistance is commonly a few megohms; at 800 degrees C it may be as low as 100 ohms! By measuring the probe's internal resistance, it is possible to calculate probe temperature, allowing effective correction for the signal output changes caused by alterations in temperature, rather than by variations in the air/fuel ratio. The techniques by which sensor internal resistance is measured (without disrupting the near-continuous reading of the sensor output) are very interesting. These techniques are also the key to the accurate measurement of the air/fuel ratio with conventional oxygen sensors used in locations where they will be subjected to high temperatures (ie over 600 degrees C). This approach is characterised by the switching of a precision resistor across the sensor output, with comparison made of the loaded and unloaded output voltages. From this, the sensor's internal resistance can be calculated. The unloaded sensor voltage is sampled at 10ms intervals, while sampling of the sensor in a loaded state occurs for only 5ms every second. A load ratio of 1/200 is thus established, preventing memory effects (falsification of the unloaded sensor output due to the previous high current load) while still allowing quick response. Because it is vital that the sensor's output have a sufficiently quick recovery after load sampling, three different load resistors are actually used. The different load resistances are chosen based on the various internal resistance ranges, with higher load resistances chosen at higher internal resistances. Load resistances of 500 ohms, 2000 ohms and 5000 ohms are commonly used. The above technique for calculating internal resistance has a shortcoming - while the measuring of the voltage output of the sensor in loaded and unloaded states are considered to occur simultaneously, of course they are not! When the output voltage of the sensor 'switches' rapidly at the stoichiometric point (14.7:1) this can cause measurement problems. This problem is eliminated a given voltage is applied to the sensor and the current flow through the sensor is measured. The internal resistance can then be calculated from the voltage and current. An AC voltage of 2000Hz is used, with the AC able to be easily separated from the DC signal voltage and then evaluated. The internal resistance determination can be performed at short intervals (such as 2 seconds) as the thermal mass of the sensor prevents unduly rapid temperature changes in this time frame. Signal sampling can be at 10ms intervals. Instead of switching a load resistor across the sensor output, a transistor can be used. In this configuration, an NPN transistor with its base and collector connected together is selectively switched across the sensor output. This circuit has the advantage that the loaded output voltage changes with the logarithm of the sensor's internal resistance, allowing measurement of a very wide range of internal resistances. In many respects, the common zirconia oxygen sensor is a very poor sensor indeed. Its output is extremely non-linear; when it is cold its response time is slow; and its signal voltage varies almost as much with temperature as with air/fuel ratio. These negative traits exist for all zirconia sensors; the so-called wide-band zirconia sensor is only marginally better in its response at air/fuel ratios well away from stoichiometric. These sensor characteristics make the measurement of air/fuel ratio a complex task if accuracy across different ratios and exhaust gas temperatures is to be maintained.